These last few weeks I’ve been seeking refuge in umami-town. In my search for new ways to intensify the savoriness in my food, I’ve been chucking Parmesan rinds into my soup pot, dashing Vietnamese fish sauce into spaghetti bolognese, and sprinkling MSG onto any- and everything. At some point during this umami trek, a taste memory dislodged from my brain—the time I had a ribeye steak brushed with a soy-butter glaze. Three flavors were working in concert: the beefiness of that marbled ribeye, the richness of the butter, and the sweet-umami bomb from the soy sauce. It was an extraordinary combination, as if the word “steak” was written in all-caps and the glaze was the highlighter that made its beefiness stand out. That memory became the starting point to a recipe I’ve been toying with, one aimed at replicating that beef-butter-soy sauce combination, to which I add even more umami flavor with sautéed mushrooms. This recipe has the advantage of being a stir-fry that doesn’t require you to have a fully stocked Asian pantry. Oyster sauce and mirin are great to keep around, but buying a whole bottle for one recipe, then not using it again for 18 months, isn’t the wisest way to spend money. The two Asian ingredients this dish requires are soy sauce and toasted sesame oil, both kitchen staples versatile enough to use for everyday cooking. First, I find a well-marbled cut of beef. Flank steak is convenient for this purpose, but I prefer thinly sliced chuck roll, which is both fattier (fat equals flavor) and less chewy than flank. What I’m looking for are pieces the size and thickness of a stick of Wrigley chewing gum. If your butcher won’t do it, I’d suggest buying a whole hunk and placing it in your freezer for 20 minutes. This makes it much easier to slice with precision. The key to tender, golden, full-flavored slices of beef is allowing time for proper marination. The sugar gives the beef a gentle sweetness, plus help it brown to an appealing color in the skillet. With soy sauce, find the highest quality you can. An entry-level soy costs around $4, and since a bottle will last you for months (if not longer), it’s worth investing in a soy sauce in the $10 range. Same goes for the sesame oil. And be sure to use toasted sesame oil, not conventional, as you’ll want to impart a deep, nutty flavor. The secret to restaurant-quality stir-fry is marinating meats with corn starch. Not only does corn starch bind the seasoning and marinade, but it also creates a thin batter that gives the proteins a light crispness while maintaining a tender lusciousness to the meat as it fries. With mushrooms, I’m looking for a varied mix—shiitake, oyster, portabella, and enoki are all good options. Don’t just uniformly slice them, though. Quartering some of the mushrooms gives them meatiness and textural heft. I also like to add asparagus, even snow peas if you desire, to bulk up the vegetables (and to avoid giving the dish a monochromatic brownness). Some tips when stir-frying: When you first add the beef to your skillet, spread it over the surface of the pan and let it sit, untouched, for a full minute to 90 seconds. You want enough time to build up the Maillard reaction, which gives meats that pan-fried golden brown color and flavor. 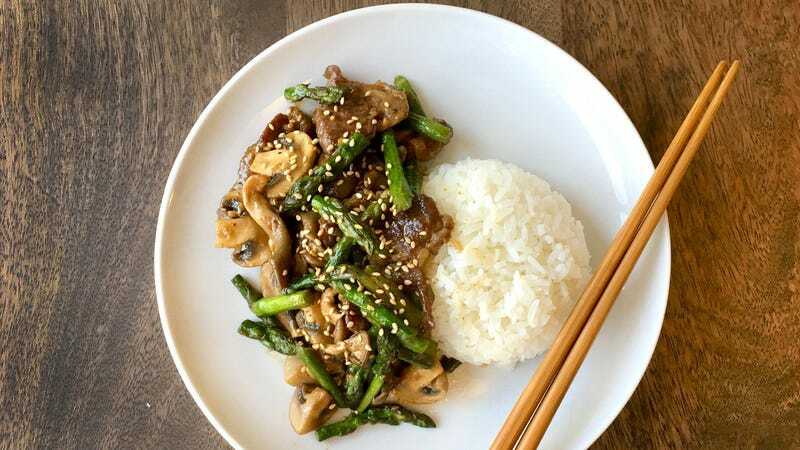 To avoid toughening the beef, you’ll want to stir-fry the beef first, remove it to a bowl, then throw the vegetables into the skillet separately. Lastly, when you add the soy and butter into the skillet, crank up the burner—it’ll help reduce the soy, and together with the butter, coat the beef and vegetables in a creamy glaze. 1. Slice beef into the thickness and length of a stick of Wrigley chewing gum, around three inches in length. Place it into a bowl, and add wet and dry ingredients of marinade to the beef. Mix well. Cover bowl and place in fridge for 30 minutes. 2. Add 1 teaspoon of vegetable oil to wok or skillet over medium-high heat and add the beef. Let sit untouched for 90 seconds, allowing the meat’s exterior to turn golden. Turn slices over in the pan and cook for another minute. Remove from heat and place the meat into a bowl. 3. Add the asparagus to the hot pan. Sauté for a minute, then add the mushrooms, ideally cut-side down, and minced garlic. Again, let the vegetables sit untouched in the pan to develop a golden-brown crust. Then add the beef back into the hot pan and stir-fry everything for another minute. 4. Add butter and soy sauce to pan and let it mingle. Turn up the heat to high, and toss the beef, vegetables, butter, and soy together, allowing the sauce to reduce. Sprinkle sesame seeds on top and serve immediately over rice.